Car Wash Advertising Reaches 10,000 Affluent Consumers! People will see your ad and take your card! Business cards increase your response! We stock your business cards for you! We design your cards to match your ad! Car Wash Advertising offers your business the opportunity to reach thousands of captive consumers affordably! At the car wash, we STRATEGICALLY PLACE YOUR AD IN FRONT of a large captive audience of up to 10,000 viewers per month as they wait and have nothing to do for up to 30 minutes. This is the reason why your business will receive the exposure needed to generate an immediate response. With this kind of downtime, it’s essentially making your business the name and face of the community. Car Wash Advertising targets your communities most affluent consumers! If someone is willing to pay $15-$30 to soap and water their car, they must be willing to pay top dollar for your services. What makes car wash advertising work is who you’ll be targeting. Car wash patrons are more affluent, from the middle class to the wealthy. They pay for services to be done for them. The most important person to advertise to is someone you know has money and spends it! We design your professional 11″x17″ car wash advertisement for FREE! We have been doing car wash adverting for nearly 15 years. We have worked with thousands of clients. We know how to create an effective advertisement that attracts attention. Our professional graphic designers will work with you from start to finish creating your top quality advertisement for FREE! cards, serving as a physical reminder of what they saw at the car wash. This makes your company accessible to potential customers after they’ve left the car wash.
Our large list of active locations gives our customers the ability to target a specific area or canvas an entire region. 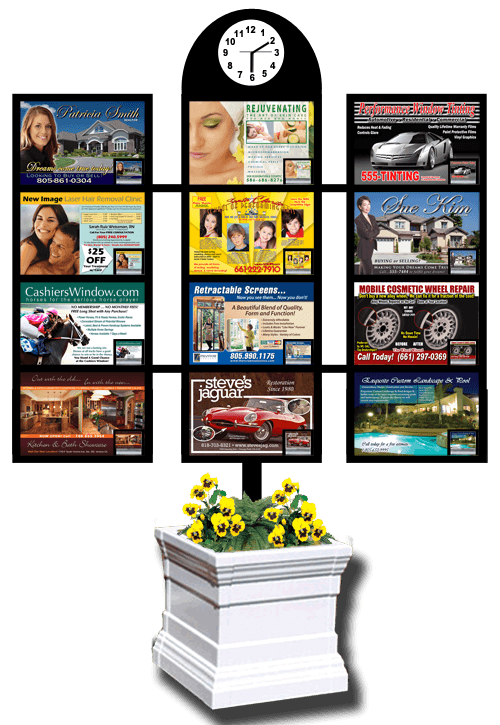 Car Wash Advertising makes it easy for businesses to reach some of the most affluent consumers in their own community! Call today to check availability in your area at 1-800-469-1120. We clean your displays and re-stocks your business cards on a bi-weekly basis, ensuring that the boards are well maintained with plenty of cards to dispense. We will notify you when your business cards are running low. Don’t have business cards yet? No problem, our professional creative team can design and print cards at affordable rates that match your ad we design for you! Targeting your communities most affluent consumers! Affluent people have both high & disposable income! The affluent are more likely to become your customer! Car wash advertising is a strategic way to reach them!